The cold and flu season has begun and the importance of good nutrition when it comes to your immune system can’t be underestimated. No one food will magically fend off the flu, but certain nutrients take the lead in helping protect your body from billions of bacteria, viruses, and other germs. Living with cancer increases your risk for complications from influenza, so people currently going through treatment, or who have a personal history of cancer, and people who live with or care for cancer patients and survivors, should focus on having a healthy balanced diet now more than ever. 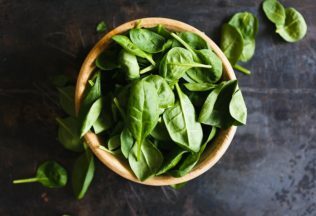 Research suggests that eating a healthy well-balanced diet benefit people during and after cancer treatment, as well as improving your body’s immune system and ability to fight infection. Generally, fresh salads and cooked veggies should make up the biggest proportion of your plate – aim for five serves of vegetables and two serves of fruit every day. Going for a variety of fruits and vegetables is key, as they provide us with different nutrients and antioxidants, so aim to eat many different coloured fruits and vegetables at mealtimes. Foods rich in vitamin C are important for wound repair and immune function and some of the best sources are citrus fruits – mandarins and oranges are in-season – as well as capsicums and broccoli. While carrots, sweet potato and spinach, which are delicious in winter soups and casseroles, have the benefit of vitamin A, a natural antioxidant. Try to fill about a quarter of your plate with complex carbohydrates like wholegrain bread, sweet potato or quinoa, and the final quarter of your plate should be a source of protein. The antibodies that help fight disease are made of protein and many foods high in protein also contain other immune-boosting nutrients – lean cuts of beef, beans and seafood contain zinc, while nuts are a good source of magnesium. Try adding in herbs and spices to your cooking in lieu of added salt and sugar for both taste and health benefits. For centuries, people have used garlic as a traditional remedy – why not add freshly crushed cloves to your stir-fry or wholemeal pasta dishes? Or add in a touch of cayenne, mustard powder, ginger or nutmeg to enhance meals and the sinus-clearing benefits that come with them. Also, dehydration is the most common reason bugs tend to stick around. If you are suffering from cold-like symptoms, increase your intake of water and hot tea, while avoiding sugary drinks and alcohol. A large amount of research suggests that drinking alcohol suppresses immune function. Having a healthy well-balanced diet is vital for your overall health and will help reduce your risk of preventable chronic disease, including some cancers, in the long-term. Chris McMillan is CEO, Cancer Council Queensland.